From the Internet, some interesting information: The Criterion Music Boxes were made in America, in New Jersey, by the firm of F. G. Otto & Sons. It was marketed initially by M. J. Paillard of New York in November, 1896. Like a previous brand that Otto manufactured, this one was also challenged by the Regina Company (maker of the Regina Music Box) over patent infringements, and was replaced by another brand, the Olympia. Olympias began to appear in 1898.
inch, 10-1/2 inch, 11-5/8 inch, 14 inch, 15-1/2 inch and 20-1/2 inch, these being the diameter of the discs they played. The discs were made of zinc on all but the smallest size machine; those were made of steel. The discs are driven by perforations around the edge of the disc except for the smallest size which was driven by a center spindle. The rectangle shaped edge-drive perforations are reinforced on the leading edge by the metal that was punched for the perforation itself. Most of the Criterion music boxes were of the single comb design, although many of the larger size boxes were available (and are found today) with double combs. Their cases were either mahogany or oak, most having pressed wood trim and carved panels in the front and sides. Matching tables and disc storage bins were also available. They are a good thing to have when storing a quantity of discs to keep them from getting damaged. 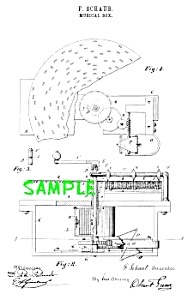 Automatic Musical Instruments" and Arthur W.J.G. Ord-Hume's "The Musical Box, A Guide For Collectors."